Questions interlace conversations. Where is Priceline stock trading? Where do the San Francisco Giants stand in this year’s pennant race? When hiring a litigation attorney, what are the key questions to ask? Are there any grammatically sound sentences in English where every word starts with the same letter? All of these questions are instantly answerable. These are the types of questions we ask at the dinner table, when sharing a drink with a friend at a bar, and answer in a few seconds a mobile phone with a Google search. At work, we’re thirsty for data to guide and inform decisions and we bring with us similar expectations of technology’s ability to answer questions instantly. As chat becomes an increasingly important user interface in the workplace, there’s a massive opportunity for startups to enrich conversations with answers to questions that pop-up in Slack and elsewhere. Looker’s SlackBot called LookerBot just does this. For example, in this video, Kim and Tommy need to figure out which customers to invite to a beta and they start chatting in the #beta-program channel. 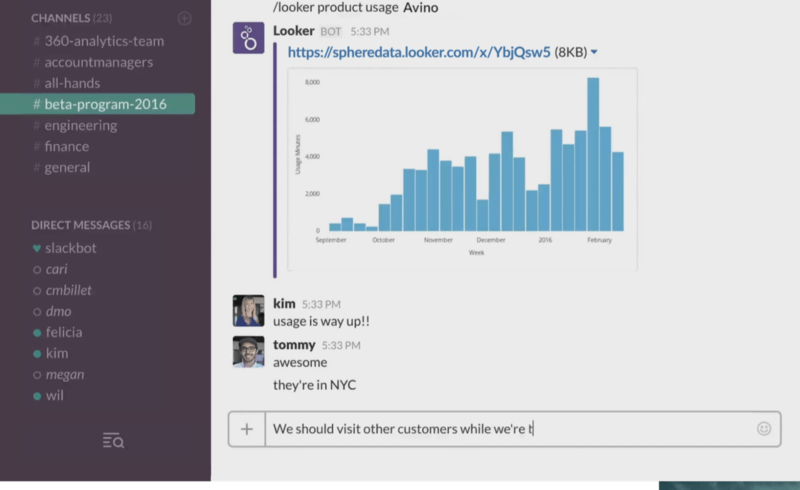 Tommy suggests one account, Avino, and then he pulls up their product usage chart in Slack so Kim can see. Enthusiastically, Kim agrees to invite them to the beta. The conversation continues as Kim plans a visit to Avino in New York, and would like to find other potential beta users in the same area. Together, Kim and Tommy view a list of customers in New York, select Granite & Co. as the second beta customer, but notice Granite’s support volume in Zendesk has spiked recently, suggesting there’s a problem with the account. The team checks with Felicia, the customer success rep, by inviting her into the channel. Felicia says all is well with the account - just a routine database migration. The combination of chat and data enables teams to move faster, make better informed decisions, bring in key stakeholders, and document rationales for decisions in case a question arises in the future. It’s the future of collaboration.